This three-day trial advocacy course being held each year and is designed for practitioners with up to five years of experience in jury trials. The course will focus on the successful handling of all major aspects of a trial from opening statement to closing argument, as well as trial preparation and post-trial matters. 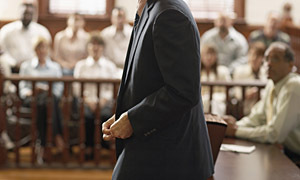 There will be demonstrations and lectures by experienced defense trial attorneys. However, the majority of time will be spent on reviewing and critiquing the performance of the participants in breakout sessions and in their conduct of a mock trial. Eighteen hours of CLE credit is anticipated. Policies: Any cancellation more than 45 days before the first date of the Trial Academy will be entitled to a full refund. Cancellations from 15-44 days before the first date of the Trial Academy will be entitled to a 50 percent refund. However, if the canceling party succeeds in finding a replacement for himself/herself, he/she will be entitled to a full refund upon payment by the replacement (less $100.00 processing fee). Cancellations less than 15 days shall not be entitled to any refund. However, if the canceling party succeeds in finding a replacement for himself/herself, he/she will be entitled to a full refund upon payment by the replacement (less $100.00 processing fee). Law firms who reserve a spot for one attorney in the firm may substitute another attorney of that firm at any time without any penalty. The mission of SCDTAA is to promote justice, professionalism and integrity in the civil justice system by bringing together attorneys dedicated to the defense of civil actions.